Some lucky people are born with the ability to play by ear, and so never need to worry themselves much with learning how to read music, key signatures, rhythm, melody, and harmony. For the rest of us, though, a solid grounding in at least the basics of music theory is an essential part of learning to play an instrument. Furthermore, as you progress through the music examination system, you will reach a point where you have to take a music theory test. So it is well worth your while getting to grips with the basics of music theory early on. In any case, it will help you play better and progress further. I’m a strong believer in the power of technology to help you get to grips with music theory. It can be a tricky subject so anything that can help you improve quickly is a plus. The great thing about software is you can teach yourself as you go along, and get instant feedback. And being able to interact with a music theory app is like having a teacher on hand 24/7. Additionally, the best music theory software will take a structured step-by-step approach. It will give you a complete music theory curriculum which will guide you through basic music theory for beginners all the way up to intermediate and advanced music theory. Music Theory Apps also offer a variety of exercises and interactive music theory lessons, and will chart your progress as you gain confidence and ability. For Mac and PC. Available to download or on CD-Rom direct from eMedia. You can purchase or download the eMedia Music Theory Tutor software complete course for the price of a couple of lessons. Perfect for beginners and intermediates it will progress your music theory right up to advanced level. The music theory lessons in this software will teach you all the building blocks of music. 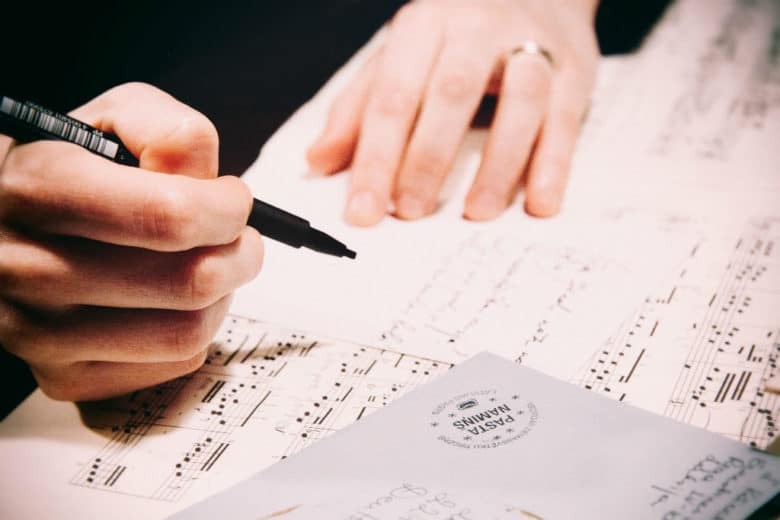 You will learn to hear musical keys, scales, intervals, chords, and rhythms to help you compose music (with or without an instrument), improvise solos, and learn songs by ear faster. So not only will you acquire your music theory skills, you will be getting plenty of ear training in the process. The really key point is the interactive nature of this software, so you get to learn by doing, not just by reading. Your virtual music theory teacher on hand when you are ready to learn. Here are just a few of the things you will cover from a one-off purchase. Learn recognition of simple and compound time signatures (including 3/4, 4/4, 5/4, 6/4, 7/4, 3/8, 9/8, etc. ), and cut time. 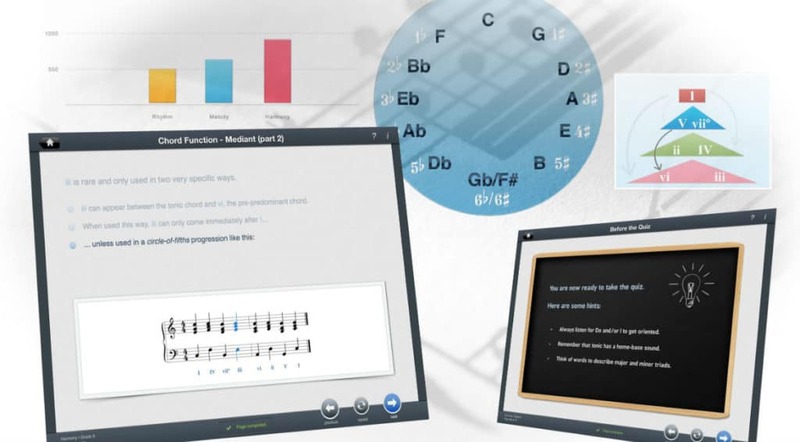 Below is a video overview of the eMedia Music Theory Tutor. You can buy eMedia Music Theory Tutor direct from the eMedia website. Complete with 43 topics, Musition is another very complete music theory tuition tool. 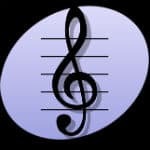 it has breadth and depth of music theory content, and this software is great for beginners through to advanced students. Designed for students of all ages and abilities, Musition’s clean and simple interface means you can use it with young people through to university students and adults. There are 43 topics in Musition, divided into seven groups: Pitch, Rhythm, Terms & Symbols, Harmony & Instruments, General Knowledge and Composition. Each topic has a series of graded levels which allows students of all abilities to comfortably use the software. Teachers can create custom levels to make sure their students are covering the appropriate topics for exams and assessments. You just need to be careful which version of Musition you buy. Student cloud licences should only be purchased after directions from your instructor. If you are working on your own rather than through a school or teacher, then you can buy the student edition for personal use. The cloud version is very versatile because it works in a browser, so you can easily access it on Mac, PC, iPad or Android. However, if you are not working through a teacher or institution then you will have to purchase Musition Student (scroll down to Student & Home) which is not browser-based. For the young, and young at heart, Music Ace Deluxe Music Making Software for children contains a range of music theory games which both entertain and educate. Based around a cartoon character called Maestro Max, Music Ace teaches a range of music theory concepts from reading music notation through rhythm, scales and key signatures, ear training, and then tests you with plenty of quizes and games. Music Ace Software also comes with a musical “Doodle Pad” which is a really easy to use composition utility with drag and drop notes, and a choice of instruments. Children are soon creating their own sequences and tunes with this utility. Although the eMedia Music Software for Kids range is not specifically music theory software, it is a very cost effective way for young children to learn their music theory basics while also learning their chosen instrument. For example, the award-winning My Piano software was designed as a complete, engaging course of over 100 piano lessons for kids. 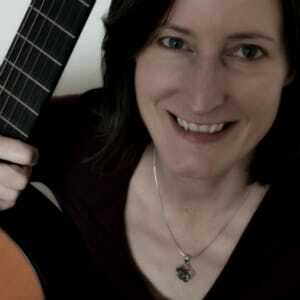 Pam the Piano, teaches music basics including rhythm, how to read piano sheet music, and play popular, easy piano songs. Your child will get a good grounding in theory while enjoying all the interactive games. Also available are My Violin, My Guitar and My Electric Guitar. Musition software has always been considered class leading with good depth of content, a flexible curriculum and excellent learning tools. So their range of Musition Apps for iPad are definitely worth purchasing. Each app covers one aspect of music theory in depth, and they are all very reasonably priced. The topics covered are: Symbols; Note Reading (2 apps, beginners and advanced); Rhythm (3 different apps); Intervals; and Key Signatures. These apps are only available for iOS. Ultimate Music Theory is an effective music theory learning tool for iOS. You can learn music theory fast, and whenever you have a few spare moments with your iPhone or iPad, with over 7000 expert-designed Music Theory Flashcards at your fingertips. This app has 6 progressive theory subjects to enhance your learning. This customized flashcard repetition algorithm cuts your memorization time dramatically. It also drills down into what you don’t know through an intelligent algorithm. Music Theory Pro is both a music theory and ear training app for iOS (and also for Mac) in one package. This app is designed to make practice fun, so you put enough time in to get a thorough grounding in music theory. In this app, you will be presented with a note, key signature, interval, chord, scale, or tempo. Your challenge is to identify what you see or hear as quickly as possible to earn high scores and beat other people who are playing around the world. If you prefer, you can simply play on your own and you’ll never be forced to post your scores. The interactive nature of the app itself, and the social aspect of playing with others makes it a very satisfactory way of learning the basics and more. As you become more advanced you will find there are: Competitive Games in which you can post your score to compete worldwide; Ear Training Chords, including inversions, and open voicings; Ear Training Scales covering different modes including Western Scales, Blues, Whole Tone, Pentatonic, etc; and Jazz Chords and Scales. The Music Theory Helper app has been designed to help you easily understand and find info about music theory. It also incorporates lesson summaries, quizzes, tests, and a glossary for a nice learning experience. One of the best iPad Music Apps for Kids, in Treble Clef Kids you and your child can learn to read music together. Treble Clef Kids incorporaties four octaves of the piano keyboard and both staffs of the musical clef. It includes both the C Scale (white keys) and Chromatic Scale (white and black keys). This app is an interactive and educational way for kids (and adults too) to learn the basics of music theory. “Practice” mode, to explore the piano keyboard and see the corresponding note names and location on a musical staff. The interactive playing of the piano encourages students to seek the correct answer through the sound of applause, while providing quirky sounds for wrong answers without penalty. In addition, there are no advertisements for wandering kids’ fingers to stumble upon. A really nicely thought out learning experience for children. I’m a big fan of online courses because they are multi-platform and most will allow offline access too. This means you can work through modules on your laptop, tablet or phone, and track your progress across devices. Udemy is a massive platform of courses, and there are plenty of really excellent music theory courses available. The great thing about buying a course off Udemy is it is a one-off purchase and you own it forever. You can see reviews of other students and get a great idea of what you are buying before you commit, with free tasters. Finally, you can ask for your money back if you are not happy. Once you have bought a course of Udemy, you can follow it offline on your tablet via their app, you can watch it on TV, on your computer, even on your phone. Plus there are often brilliant promotions and huge discounts on courses. So keep your eye on their offerings. Another approach to buying one-off courses is to take out a subscription with LinkedIn Learning. For as long as you are a member you have access to all their courses. 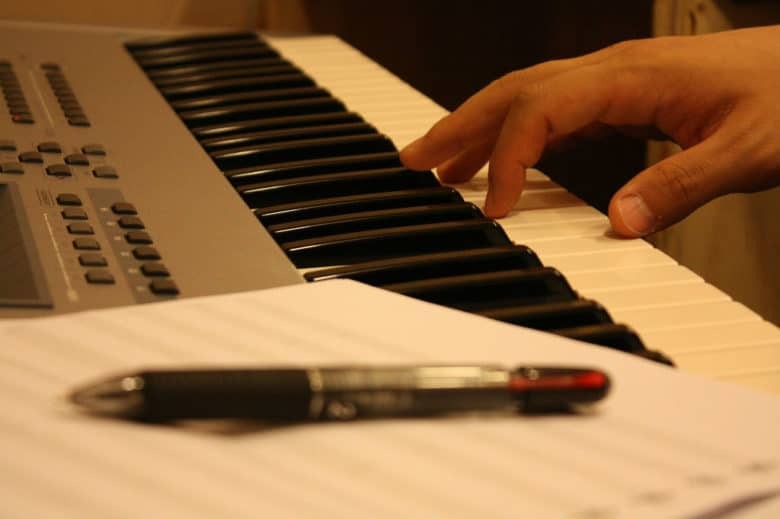 As well as an extensive selection of courses on music theory, there are also numerous courses on music production, composition, learning various music instruments and much more. So this is an excellent option if you want continued access to lots of different learning experiences. Although there are plenty of software and online options for learning music theory, let’s not forget the old-school option of a really good textbook. 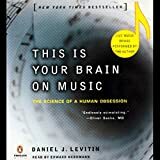 Here are the current top 10 most popular music theory books.